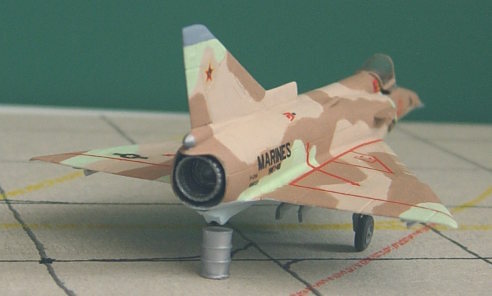 If, like me, you like some bright and odd colors among the plain gray/green/brownish military aircraft models on the shelf, then jubilee schemes and aggressor aircraft are the best pick. The Kfir is actually one of the better ones among Dragon's 1/144 kits, apart from that notorious 'zombie' filling the cramped cockpit and a mediocre fit of parts. The dimensions are right and the shapes match the real thing well. 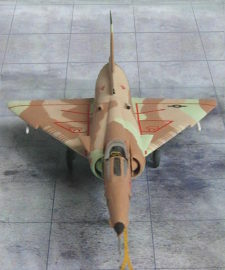 The model depicts Kfir C-1 airframe 999735 c/s '01' as operated by VMFT-401 'Snipers' at MCAS Yuma between June '87 and October '89. Some excellent detail color pictures of this one and other F-21A's can be found in Osprey Superbase series nr.9 'Yuma' by George Hall (ISBN 0-85045-946-X) and some more in Osprey 'Aggressor aircraft' by Chuck Stewart (ISBN 0-85045-986-9). I cut up the kit decals (serials and bort numbers) for this scheme. No F-21A Kfir is complete without an oil drum strategically placed under the lowest place of the fuel tank below the rear fuselage, as the Kfir proved to be among the worst fuel leaking planes in the US inventory, second only to a cooled down SR-71. The oil drum came from a set of Preiser N-scale 'freight loads', although I'm sure there are other (cheaper) ways to find an oil drum at this scale. replaced the pitot tube with one out of stainless steel magazine staple. cut open canopy to place it in slightly raised position. removed zombie from cockpit and added some details. thinned down the canard planes. improved the shape of auxilary inlets on fuselage spine and belly. opened up the twin inlets in the base of the tail fin. separated the end of the lower fuel tank from the fuselage tail section. improved shape of exhaust recess in tail. shortened exhaust pipe by 1mm. Date finished: May 1, 1994. The F-5E comes together with the Kfir in DML's 'the Adversaries' double kit (cat 4008). Whilst the Kfir clearly is the better of the two kits, the F-5E can also be made into a credible looking model. Do make sure the forward fuselage fits the rear section, a bit of extra care here saves a lot of sanding later. 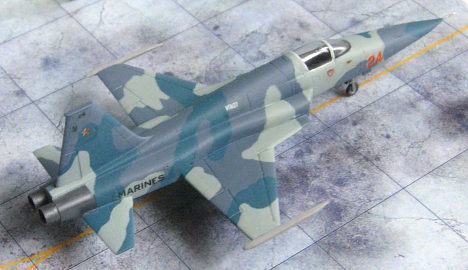 The model represents a NFWS Top Gun F-5E, serial 160794, bort (5)45 in a color scheme that looks like a variation on USAF's 'New Lizard' scheme. Paints used are Polly S over Humbrol, both colors mixed to match Fed.Std. 30140 and 20400. That shiny tail is brush-painted with Humbrol Metal Cote 'Polished Steel' over a coat of gloss varnish. I love that stuff, it's the easiest way to get a piece of plastic to look like real metal: paint with a brush, let it cure for 15 minutes, mask surrounding painted surfaces (to avoid stains), burnish with a cotton tip (Q-Tip), remove the masking and that's all. No sealer required, yet it won't deteriorate with age (I first used it over 20yrs ago and that model still looks as shiny as it did the day I buffed it). Date finished: April 10, 1998. The Revell F-5E kit (cat nr.04018) is modeled after an updated Swiss AF F-5E, so it comes with the enlarged squared-off LEX's and a flattened 'shark nose' radome. The kit comes with decals for Swiss AF and a New Blue aircraft of VFA-127 'Cylons' bort 24. 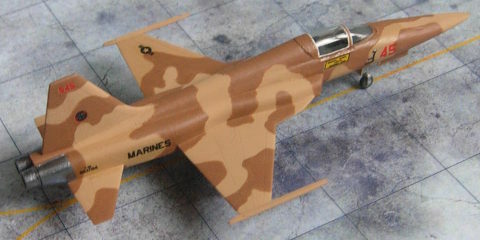 The Revell F-5E kit is a bit tricky to build because wings and tailplanes lack mounting tabs. The tail fin and tail planes are too thick, but filing these down to a credible thickness means that all details are lost, so for the tail fin I just fitted a tail cap antenna to mask its thick cross section and filed down the edges. The kits lower rear fuselage lacks the hollow cross section just in front of the exhaust pipes. The kit also has the auxilary inlet louvres on the fuselage sides behind the wings in open position, which is great for a Swiss F-5E, but with the US versions these louvres only open on take-off, so I puttied the louvres shut. This VFA-127 F-5E is an ex-USAF aircraft, an earlier model with pointy nose cone and smaller LEX's, which is fairly easy to convert but it looks like I forgot to change the LEX's. I did change the shape of the nose cone and added a stainless steel pitot tube made from a magazine staple. Date finished: April 24, 1999.